Sparknode Review 2019: Is Sparknode a Good Hosting? SparkNode has been delivering cloud hosting services to over 130 countries around the globe since 2012. The Hivelocity company privately owns and operates their data centers to ensure that all their customers receive the very best hosting solutions and a 99.99% uptime promise. SparkNode offers cloud hosting solutions for individuals and businesses in the United States and over 130 other countries around the world. The company has powerful, state-of-the-art, pure SSD cloud servers in three locations across the United States: Tampa, Los Angeles, and Atlanta. This allows users to choose their preferred server locations as a way of minimizing their website loading speeds. These blazingly fast data centers plus their superior redundancy protocols are the web hosting provider’s guarantee that any website they host will have 99.99% uptime. SparkNode supports instant deployment and allows their users to choose their resources, level of management, and preferred operating system. Their website is available only in English. 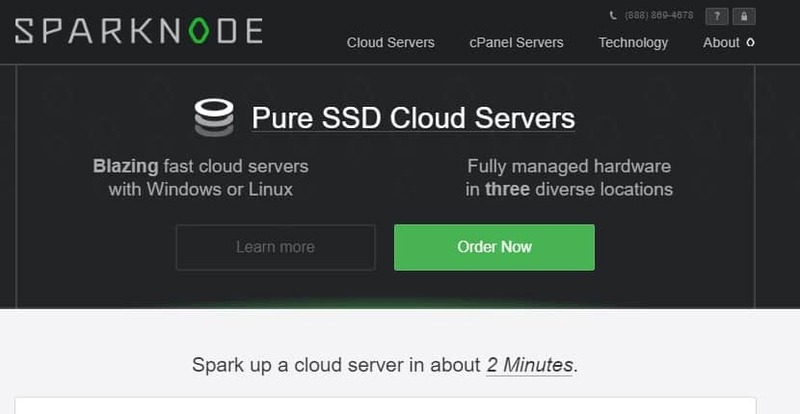 SparkNode gives users full control over their cloud server. Once you’ve made payment for your node, the entire process of deploying and setting up the node can be completed in a matter of minutes. You can choose to manage your cloud server yourself, or pay an additional monthly fee to have their team of technicians manage it for you. Further, if you already have an existing website with another service provider, SparkNode can handle cPanel-to-cPanel migrations — but only if you’ve purchased the aforementioned management service. SparkNode performs weekly backups, but these are not accessible by end-users: you’ll have to make sure to back up your website on a regular basis on your own. This was slightly disappointing for a cloud hosting service, as many other cloud hosting providers include automatic daily backups for free. The advantage most cloud hosting providers have over regular shared hosting is that cloud servers are almost infinitely scalable: SparkNode’s servers are no different. You can contact their team to customize your plan right from the beginning, or scale your plan up or down as needed later on in the process. SparkNode offers no free version of any of their hosting packages. All the same, all of their available hosting options have a wide array of features that any cloud enthusiast will love. Their packages are relatively pocket-friendly, though the included features seem rather sparse compared to leading cloud hosting providers in the industry. Upgrading and downgrading your plan is simple enough, but you’ll have to contact their tech support to do so: there’s no option to do it directly from your user management portal, unfortunately. One impressive aspect of SparkNode is that their technical support team is always on standby with a short wait time of just 15 minutes. This team is always ready to help you through the process in case you get stuck. While the company responds fairly quickly when you send an email to their support team, it does not currently have a live chat. Getting a response when you send them a message via their contact form on their website can sometimes take a while, depending on what time it is. The best time to send email queries is during office hours. Past that, it’d be better to call them and explain your situation. In my experience, the company’s technical support staff was very helpful and understanding. I felt that they adequately answered all of my questions and gave me clear guidance. SparkNode, a Hivelocity company, is a decent web hosting solution for businesses in the U.S. and abroad that appreciate the value proposition of the cloud and cloud technologies. Their many years of experience have made them a reliable partner in this space, especially for businesses that conduct most of their trade on the web. Wondering how Sparknode stacks up against other Web Hosting companies? Enter any other Web Hosting company and we will give you a side-by-side comparison.